What a beautiful song! From the moment it starts with Maddie’s sweet vocals you are reeled in and lost in it right away. Maddie sings this song solo and Dawson and Emma provide killer harmonies. This song is a stunning ballad which is delightfully rich and engaging. The melody is light, wonderfully chilling and rather enchanting with a dreamy, mellow acoustic feel. 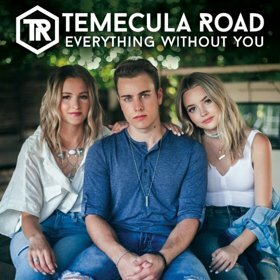 Everything Without You is a very welcome new sound to Temecula Road, showing a more mature yet vulnerable side to the trio. The lyrics are heart felt, uplifting, affectionate and relatable with an endearing chorus. Ballads suit Temecula Road, I didn’t know that Maddie could sing like this, I knew she was a great vocalist but this song really proves her vocal ability to be quite something and the harmonies are just divine. Everything Without You is produced by Mike Daly and is written by Tom Douglas (The House That Built Me), Caitlyn Smith (Like I’m Gonna Lose You), and Nick Brophy (Trip Around The Sun). Temecula Road will be in the UK next week as part of Country Music Week which I cannot wait for. I am especially excited to hear this song live as think it will fill the room and leave the audience captivated. You can catch Temecula Road at the Launch night for C2C Festival at Bush Hall on Friday 6th October where Bob Harris will announce the line up and then music will follow from Temecula Road, Logan Brill, Walker McGuire and Levi Hummon. Temecula Road will also be playing The Borderline Thursday 5th October with Eric Paslay and Jillian Jacqueline as well as the exciting Daytime Hub with Jillian Jacqueline, Levi Hummon and The Adelaides where you will get to see them perform, have a meet and greet and watch a live Q & A.